At the beginning I recommend you to go through the entire platform and explore the various modules and their pages (sections). Each section has detailed help (green button in the upper right corner). Start with the main page Analyze - Builder. 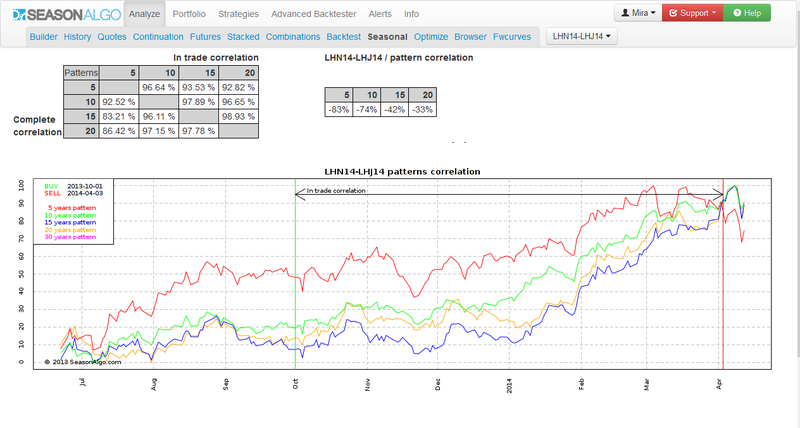 You will get quick overview of the platform and learn how to build spreads for further analysis. You can also check out our introduction videos. If you do not understand something after reading the help, please ask in our forum, we will answer it there. We are open to your ideas how to improve our platform. All users have access to our support system where you can review all issues, comments, votes and also insert your own issues. You can request new features or report errors. You can do this via the red button Support in the upper right corner. 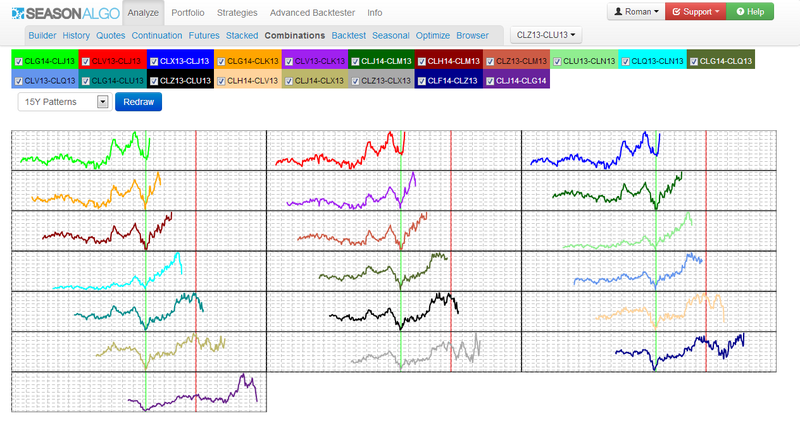 SeasonAlgo has five modules: Analyze, Portfolio, Alerts, Strategies, Advanced backtester. 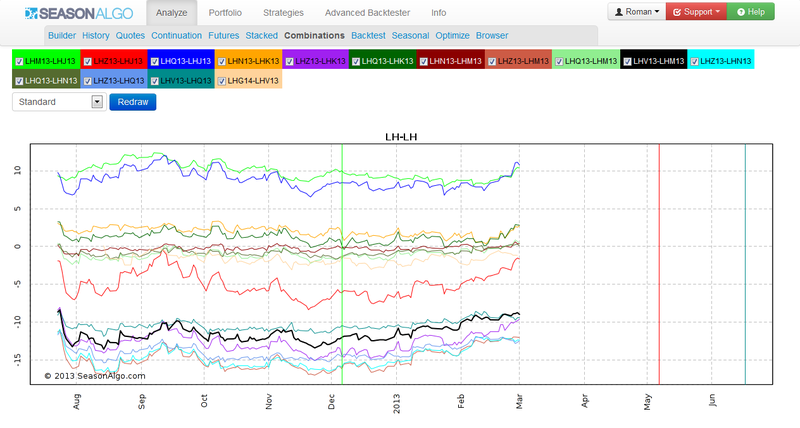 The most important are these modules: Analyze, Strategies, Portfolio. 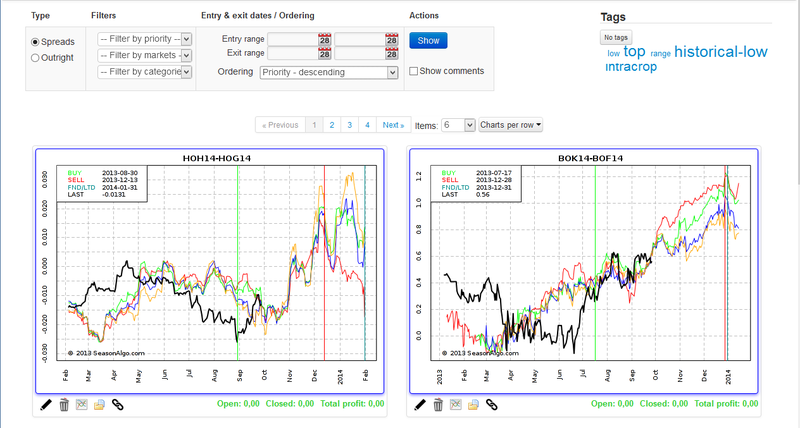 In this module, you can analyze your outright or futures spread trades. The main part is Builder, where you have to define and build your trading position. This position is then used in other tools in Analyzer. Description and overview of the tools in Analyze module can be found here. 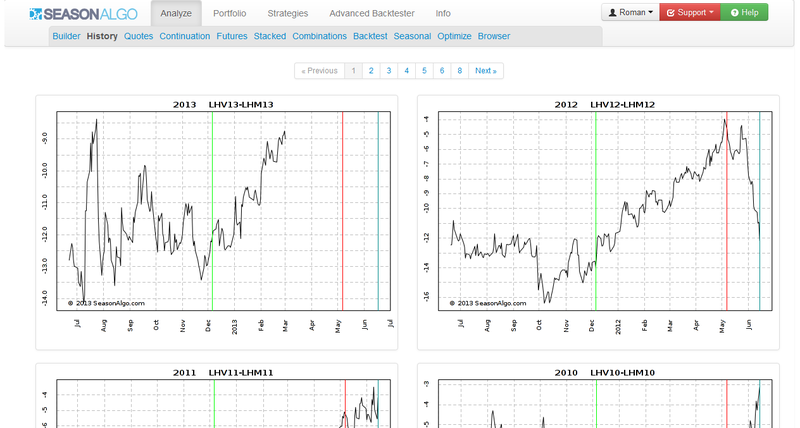 You can analyze any manually created position, or use Strategies module where you can find seasonal strategies for next several months for both futures spreads and outright. Once you find an interesting strategy, you have option to open the Analyze module and analyze this strategy in greater detail. I would recommend you to at least explore stacked and continuation charts, where you'll see current year position compared to previous years and find if spread moves on its historical high or low. 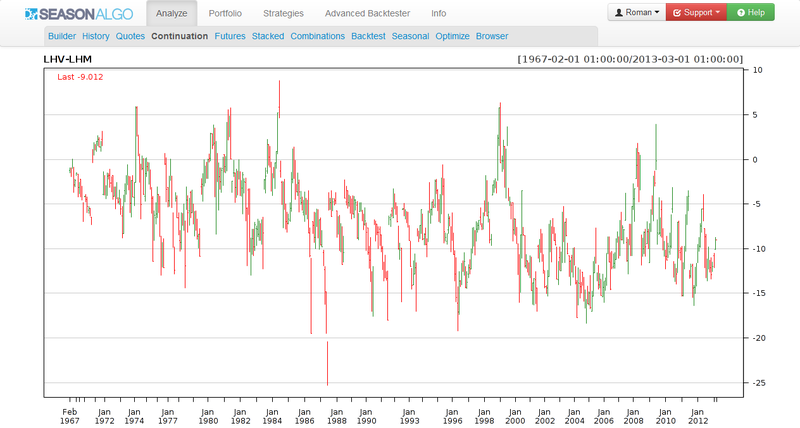 It is also very useful to explore the historical charts to see how the spread was moving during selected seasonal window. Do not forget to explore Seasonal section. 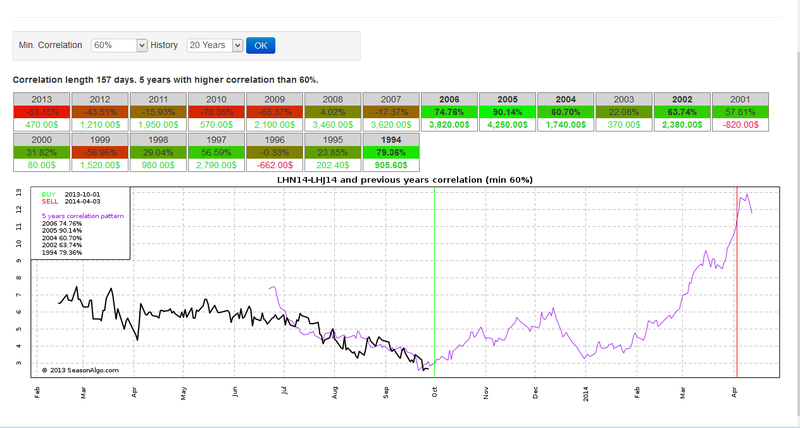 Prefer higher correlations between seasonal patterns (long and short term seasonality didn’t change) and it‘s also good to check if the spread does not correlate with loosing years. 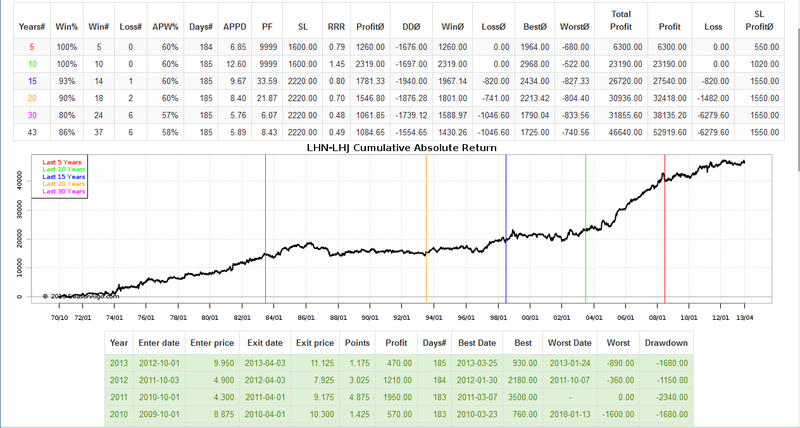 Finally, do backtest for selected seasonal window to get a quick overview of strategy numbers (win, average profit, loss etc.) for last 5,10,15,20,30 years. 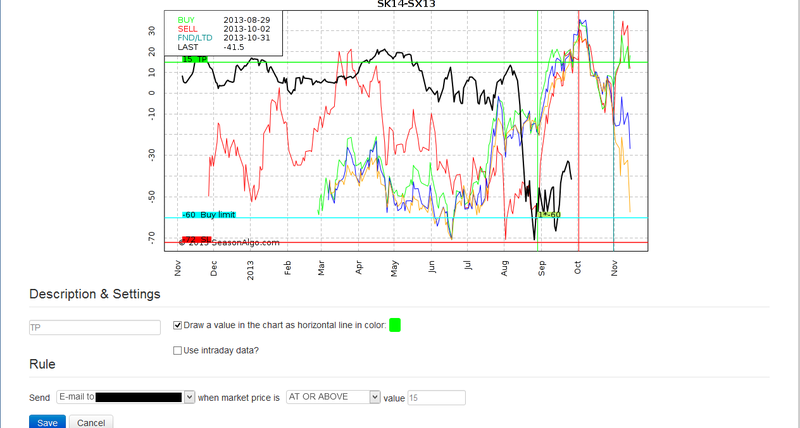 If you completed your analysis of chosen seasonal strategy, it is time to move this trading strategy into portfolio. You do this in section Builder, select the folder (next to the save button) where you want to save strategy and click the Save button. 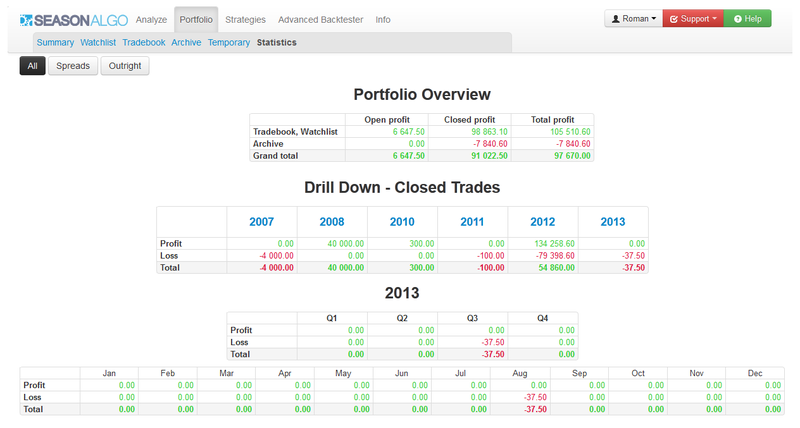 Portfolio has four folders - Watchlist, Tradebook, Archive and Temporary. 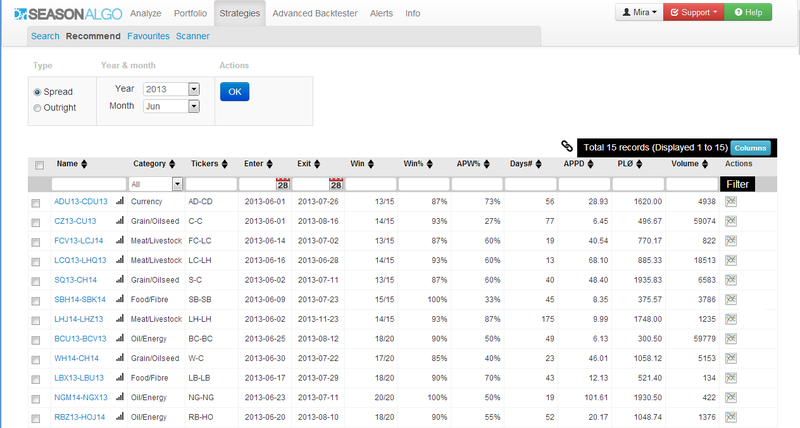 Trading strategy with planned entry or good potential, save into Watchlist folder. 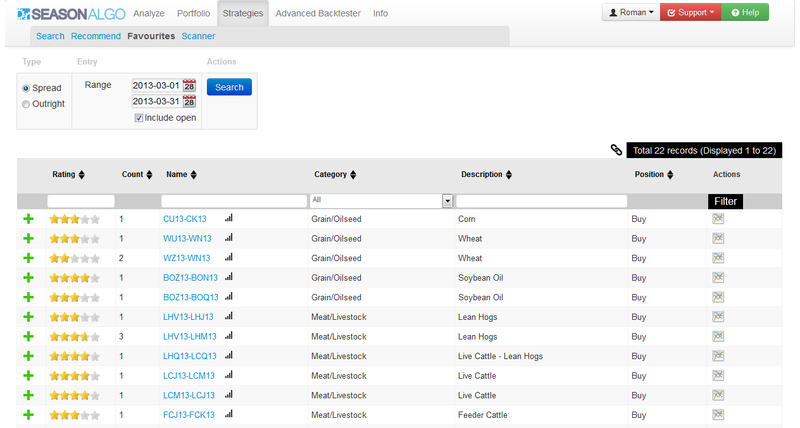 Once you enter the position, insert trading records and change the folder to Tradebook. This will give you good overview about positions where you plan to enter and where you have already entered. For each position in portfolio, you can keep record of the other interesting things, such as price alerts (you will be notified when the price will touch a selected price), personal notes, priority or personal tags. 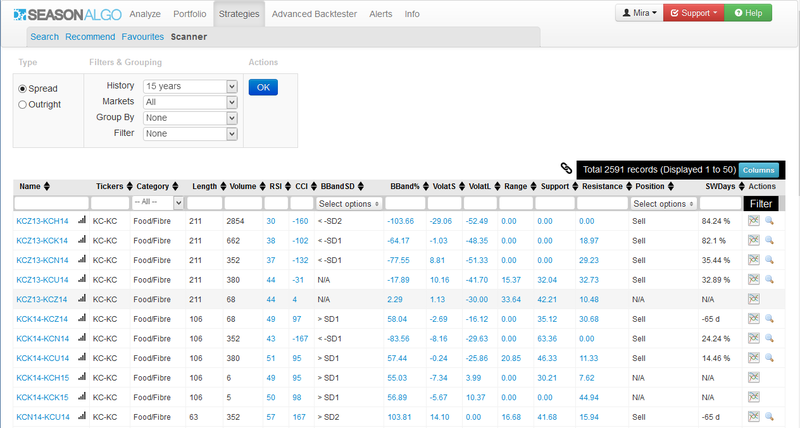 Priority and tags are used for user defined filtering of the portfolio. For example, you can set the tag "May" for all spreads that have entry day during May and later use this tag for filtering. 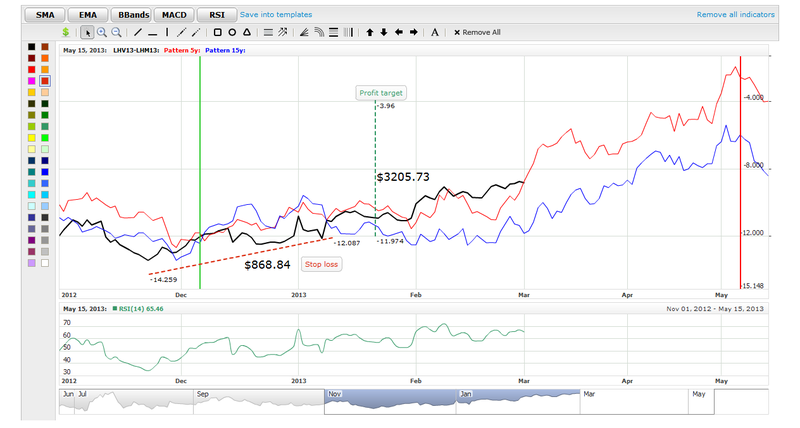 When you open some folder in portfolio, you can notice borders with various color for each chart. Border color represents priority of the chart and you also use it for filtering. 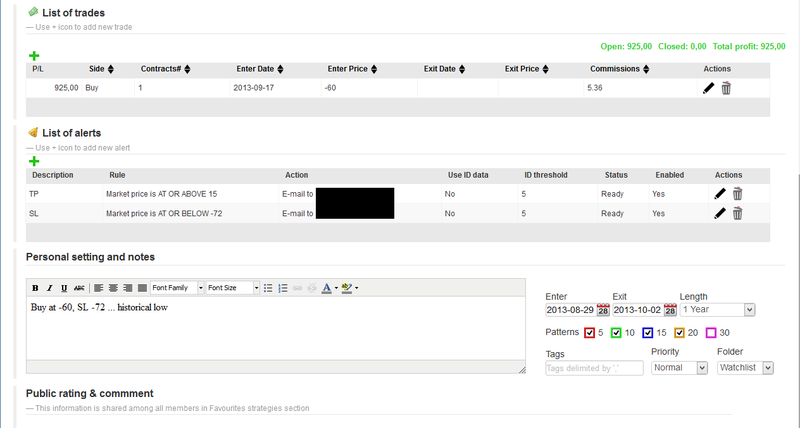 When you close your trading position, open the editation form and set the exit price and date. When you are closing your trade, it isn’t necessary to close all open contracts. Just change the number of contracts and fill in the exit date and price. The system will automatically close the specified number of contracts and create new open position for the rest of the contracts. For example, when you have 4 open contracts and you want to close only 2 contracts (can be the first profit target). 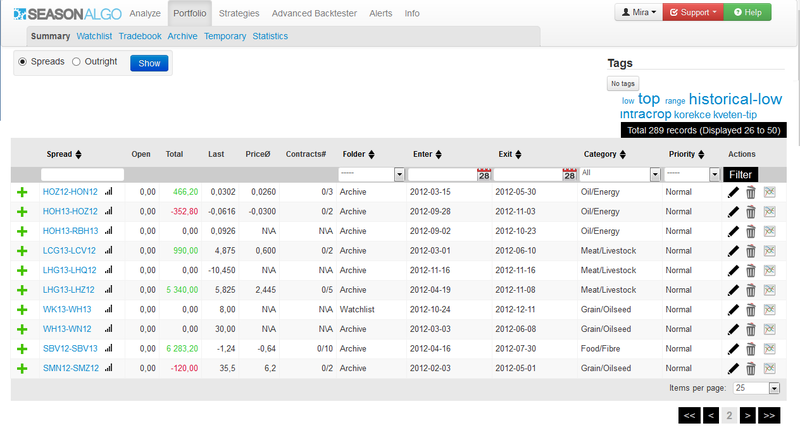 Edit trade, change the number of contracts to 2, fill in the exit date and price and click Save. Trade with 2 contracts will be closed and a new one with 2 contracts and original enter date and price will be opened. 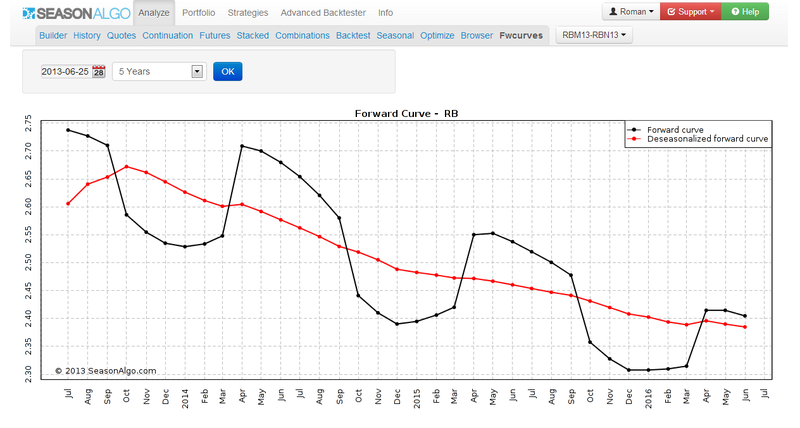 Move this position into archive folder, if you don't plan to trade this seasonal strategy again. 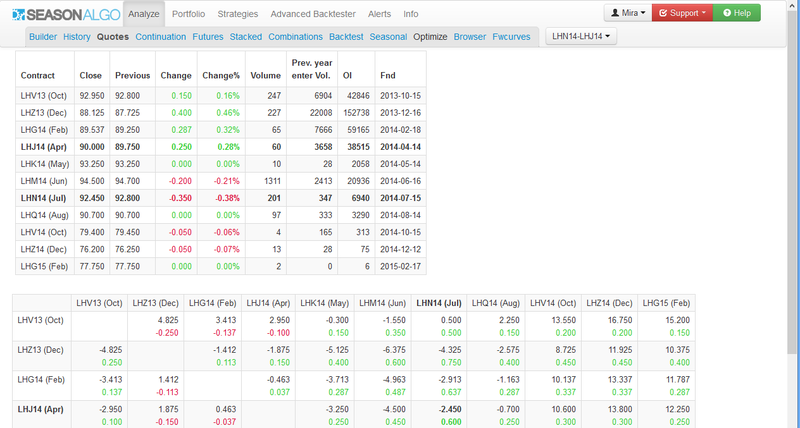 As mentioned above, you can manually create any kind of futures spread or outright position in the Builder section. You can run Optimize for this position. 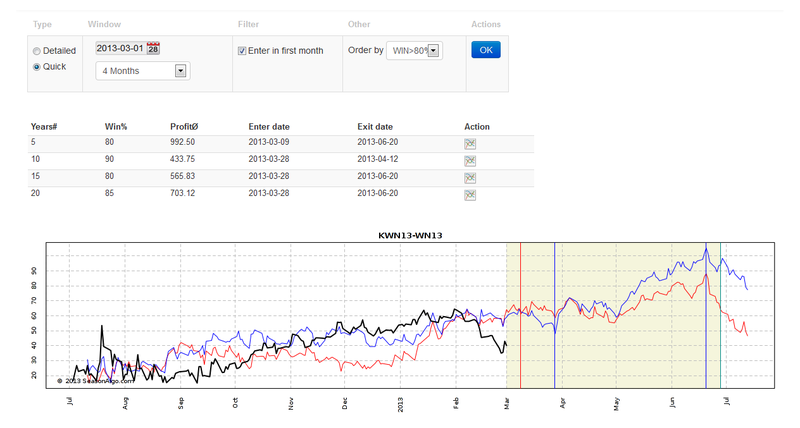 Optimization will find the best possible seasonal window based on your parameters. You can download the pdf for any spread and view all the combinations of the spread. PDF files can be downloaded in the Browser section. 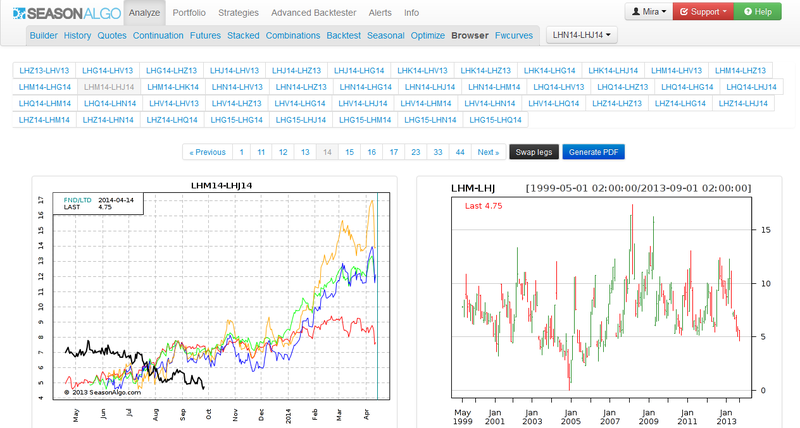 For example: create any corn spread and then open Analyze – Browser. 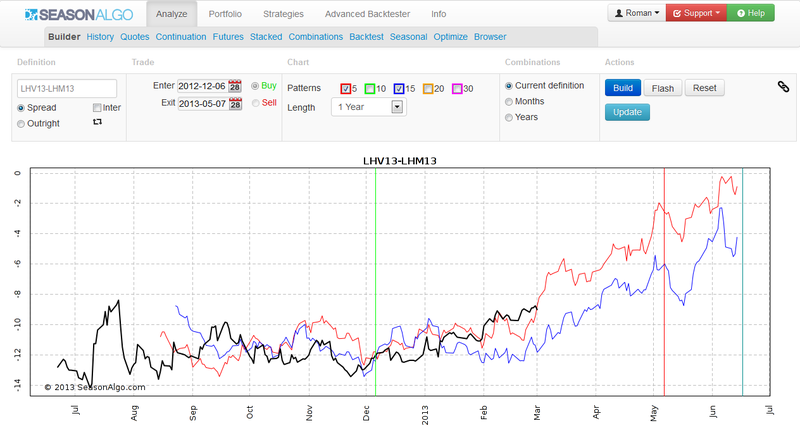 Here you can explore all the combinations of corn spreads or you can download a PDF with these spreads. 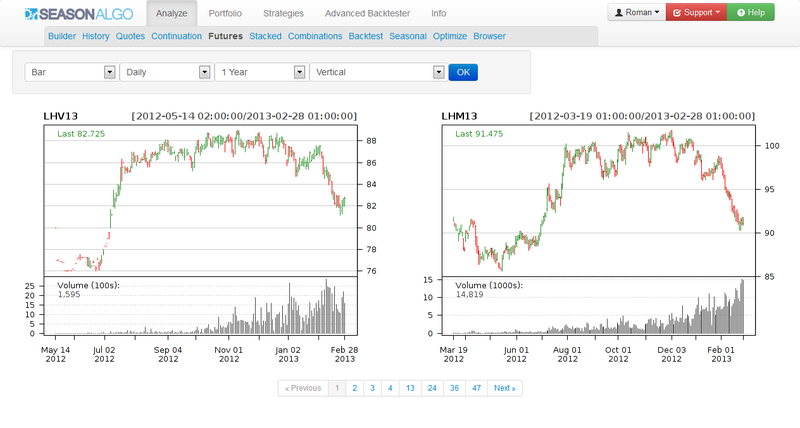 When you click on the spread chart then analyze module will be opened with same setting. 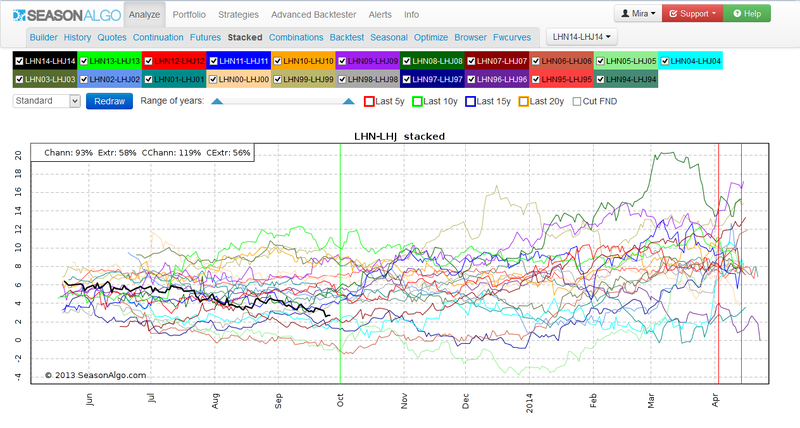 Use the Strategy module where we give you hundreds of the strategies for each month and smart search engine to find the strategies which suit your trading style. 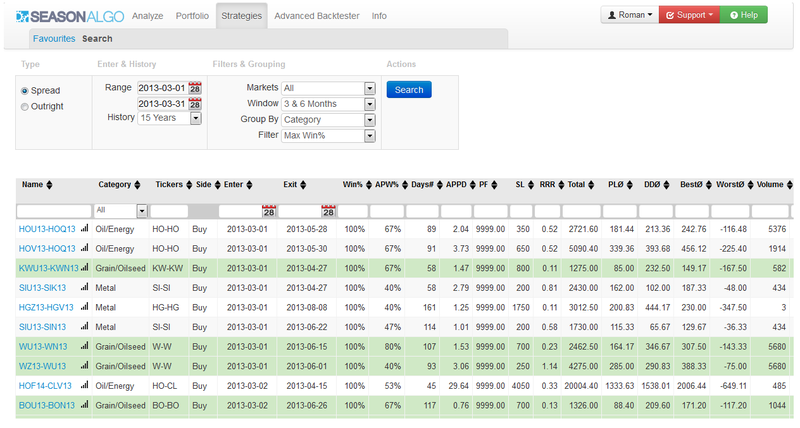 You can use Smart search engine to find a strategy according to your trading style. For example you can simply find the futures spread which is currently moving in channel or at historical lows/highs. You can filter long / short term strategies, strategies that move around a historical highs / lows, strategies with higher correlation of the seasonal patterns and much more. Please read the help for this section, it is necessary for understanding of all available features. If you are a beginner trader and you are overwhelmed by number of strategies in our database, you can use our recommended monthly strategies as a start. 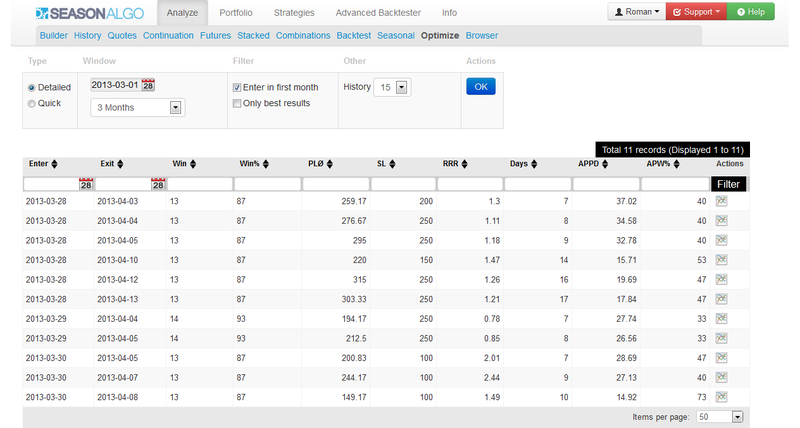 Every month we select cca 15 outright futures and 15 spread strategies from all strategies available for that month. You can find it in Recommend section.